Outline: Lessons from 'The Living Christ' #16 - Pictures 1, 7, 8, 9, 10, 11, 12, 13, 16, 17, 24, 57, 107, 110.
Who is Jesus? Is He just a man? Is He God? What are the names and titles given to Him in the Bible? Let us look at some of those names and see what they mean to us. Find these pictures from "The Living Christ" series - 1, 7, 8, 9, 10, 11, 12, 13, 16, 17, 24, 57, 107, 110. "In the beginning was the Word, and the Word was with God, and the Word was God. All things were made by Him." Verse 14 says, "The Word was made flesh and dwelt among us." This refers to Jesus. What do we learn about Him? We learn He was from the beginning. That means He is ETERNAL. He has no beginning or ending. He was not created. He is GOD. He created all things, so He is the CREATOR. He is called the WORD. As the Word He shows us what God is like and gives God's message to us. Just as our words show others what our hearts are like, so Jesus Christ is God's word to reveal God to us. He spoke God's word to us. He proclaimed God's will and told us of His forgiveness. To do this, He was made flesh and became a MAN as verse 14 tells us. How did the WORD become MAN? 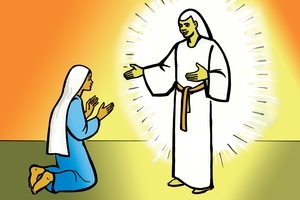 Here we see the angel Gabriel talking to Mary. He is telling her that she will have a son. She is to name Him JESUS, which means Saviour. Mary asked the angel, "How can this be possible? I am a virgin. I have not lain with a man." The angel answered, "Nothing is impossible with God. The Holy Spirit will come upon you. The holy One to be born will be called the SON OF GOD." Mary was engaged to a man called Joseph. 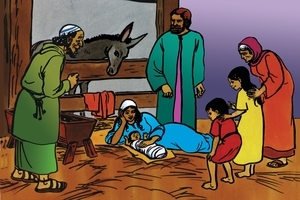 When Joseph saw that Mary was with child (pregnant) he thought she had been unfaithful to him. However, an angel came to him. He said, "Do not be afraid . The child she has conceived is from the Holy Spirit, not from a man. She will give birth to a son. Give that son the name JESUS for He will save His people from their sins. This was prophesied by the prophets. They said a virgin would conceive. He would be called IMMANUEL which means God with us." Joseph was glad and he took Mary as his wife. Joseph and Mary went down to Bethlehem to register as descendants of King David. 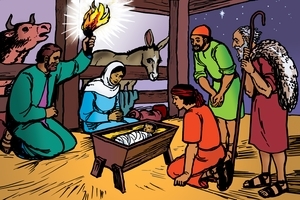 Because there was no room for them in the inn, they had to spend the night in a stable. While they were there, Mary gave birth to a son. They named Him JESUS. As Mary's son He became a MAN, with flesh like us. Because He was conceived of the Holy Spirit, He is the SON OF GOD. Jesus is both MAN and GOD. Near Bethlehem were shepherds watching their sheep. An angel appeared to them and the glory of the Lord shone around them. They were very afraid. The angel said, "Do not be afraid. I bring you good news that will be for all people. Today in Bethlehem, the town of David, has been born a SAVIOUR. He is CHRIST THE LORD." 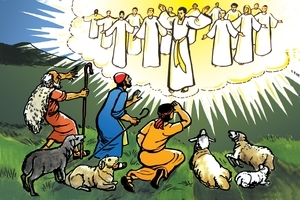 Many other angels appeared and praised God. They said, "Glory to God in the highest, and peace on earth." Here are two more names for Jesus - SAVIOUR and CHRIST THE LORD. The shepherds went to the stable and found Mary with the Baby Jesus. They worshipped Him and told Mary all they had seen and heard. They went away praising Hod and told others also what they had seen and heard. Are you praising God for the SAVIOUR? Are you telling others about Him? 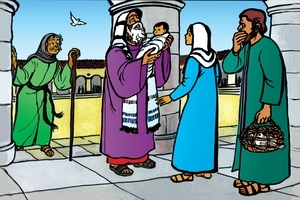 When it was time to present Jesus to the Lord according to the Jewish custom, Mary and Joseph went to the temple in Jerusalem. In the temple was a holy man named Simeon. The Holy Spirit had told him that he would not die untill he had seen the LORD'S CHRIST. 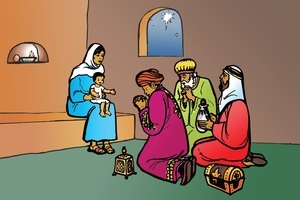 Simeon took the baby in his arms and praised God, saying, "My eyes have seen Your salvation. He is a LIGHT for the Gentiles, and a GLORY to Your people, Israel." Jesus was born not just for the Jews, but also for Gentiles. He is our Saviour too. Wise men came to Jerusalem and asked King Herod, "Where is the One who has been born KING OF THE JEWS? We have seen His star in the east and have come to worship Him." Herod did not like to hear that there was another king. 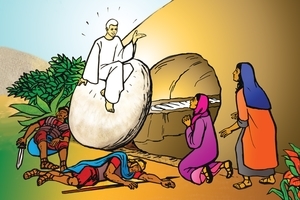 He asked the chief priests and the teachers of the law where He was to be born. They answered, "In Bethlehem of Judea. The prophets have written that in Bethlehem would be born a RULER who will be the SHEPHERD of His people Israel." Herod told the wise men, "When you have found Him, come back and tell me. I want to worship Him too." The wise men found Jesus and gave Him gifts. They went home another way because they were warned in a dream (not to return to Herod). Joseph took Mary and Jesus down to Egypt. Herod killed all the boy babies in Bethlehem but Jesus had escaped. Jesus was born to be King. Have you made Him King of your life? John the Baptist taught the people they should repent of their sins and be baptized. He told the people that there was One coming after him who was greater than he was. When Jesus was 30 years old He came to John the Baptist and asked to be baptized. 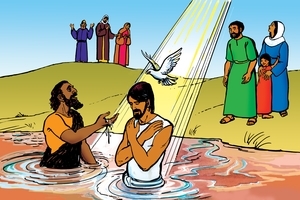 When He was baptized, John saw the heavens open and the Spirit of God descending (like a dove) on Jesus. A voice from heaven said, "This is MY SON WHO I LOVE." John knew Jesus was the SON OF GOD. When He saw Jesus again, he said, "This is the LAMB OF GOD who takes away the sins of the world." He called Jesus a LAMB because the Jews sacrificed lambs to take away their sins. Jesus fulfilled the Old Testament prophecies and became the LAMB (of sacrifice) for the (sin of the) whole world. Have you recognized Jesus as God's SON (or LAMB of God) and believed on Him? If you have, He will take away your sin. This is a picture of Satan tempting Jesus. Jesus had fasted for 40 days and was hungry. Satan tried to tempt Him in different ways. Each time Jesus answered by quoting Bible verses. He did not yield to the temptations. When you are tempted, what do you do? Do you listen to Satan? Do like Jesus did and think of Bible verses. Memorizing Bible verses is a very good habit. 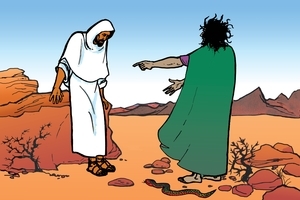 Remember that Jesus was tempted just like us. He understands our temptations and He will help us. Jesus went to Capernaum. On the sabbath He taught in the synagogue. 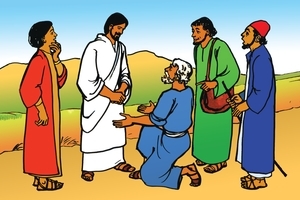 The people were surprised because He taught with real authority. 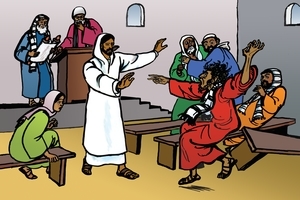 A man possessed by an evil spirit called out, "What do you want with us, JESUS OF NAZARETH? Have you come to destroy us? I know who you are - the HOLY ONE OF GOD." Jesus said to the evil spirit, "Be quiet. Come out of him." 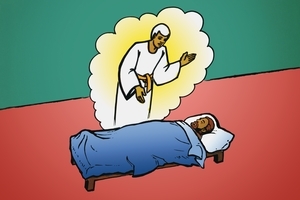 The evil spirit came out of him and the man was healed. The people were amazed. They said, "Who is this? He teaches with authority. He has power to command evil spirits and they obey Him." Yes, JESUS OF NAZARETH is the HOLY ONE OF GOD. He has power to teach and to heal. After Jesus had done many miracles, He asked His disciples, "Who do people say I am?" They answered, "Some say John the Baptist, some say Elijah. Others say you are a prophet." Jesus said, "Who do you say I am?" Peter answered, "You are the CHRIST, the MESSIAH." The Greek word for Christ is a translation of the Hebrew word Messiah - (which means) the anointed one. In the Old Testament priests, prophets and kings were anointed. Jesus is all three. He is GOD'S ANOINTED ONE. He provides all we need. The Jews looked for a Messiah to free them from Roman rule. We need a Messiah to free us from Satan's rule. Jesus taught His disciples that the SON OF MAN must suffer and die. Then on the third day He would rise again. 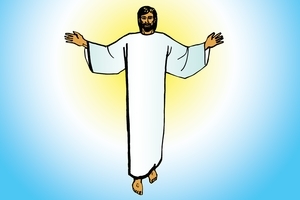 Why must Jesus die? Jesus carried all our sins on His body. He was crucified and died. The wages of sin is death, and Jesus paid that price for us. If we believe on Him, He will take all our sins away. We can go to heaven to be with Him. Jesus did not stay dead. On the third day He rose again. 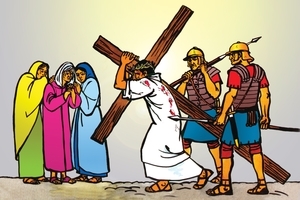 Jesus carried our sins. He died and was buried. The third day He rose again. By believing on Him we can be saved. Jesus has many names and titles. SON OF GOD, SON OF MAN, WORD, CREATOR, IMMANUEL (God with us), KING, CHRIST, MESSIAH, LAMB OF GOD, SAVIOUR, and many others. They are all important to show who He is. Perhaps the most important one is SAVIOUR for He saves us from our sins. We can have forgiveness through faith in Him. Do you know HIm? Have you accepted Him as your Saviour? GRN has recorded a version of this script in 7 languages and dialects. See full list.